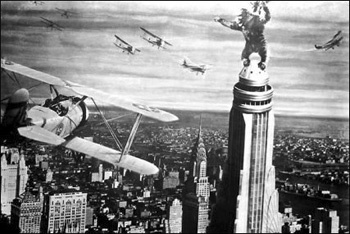 The technical and artistic magnificence of King Kong cannot be overstated... The film is thick with incredible visuals, mostly centred on the steaming, primeval swamps of Skull Island. The stop-motion models are also at their best, and in this film, they actually interact almost completely convincingly with the human actors... In Creation, the interactive scenes were but a test for this, and in The Lost World, there never was any real interaction. 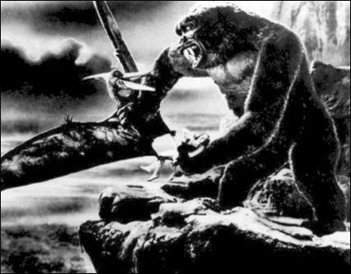 King Kong is as much a triumph of art and filmmaking as it is a ripping good yarn of 1930's adventure cinema. The concept itself is feverish to the point of nonsensical... Inspired by Miriam C. Cooper's vision of a gorilla fighting a Komodo Dragon, the Doresque Skull Island is populated by an elephantine Gigantopithecus fighting off herds of living dinosaurs. Gone is the simplicity of carrying out a single concept like in The Lost World, and its place is fantasy heaped upon absurdity. Also, the dinosaurs were reduced here, for the first time, to movie monsters serving little purpose but to hazard the protagonists. Gone was the ecological view of The Lost World made necessary by a technical inability to make humans and stop-motion models interact. With improvements in technology came a blow to dinosaur's reputation. But Kong is what Kong is and The Lost World is what The Lost World is, and O'Bie, Delgado, Mirian C. Cooper and Ernest B. Schoedsack obviously did something magnificently right to have created one of Hollywood's all-time greatest motion pictures. A great site of all things Kong. An interesting essay by Brent Saltzman as published on the Remarkable weblog, comparing the two best films of Willis O'Brien. Time for Willis O'Brien was not good after King Kong. In the ensuing years, O'Bie produced only two more films of real public reknown, being 1933's Son of Kong and Mighty Joe Young in 1949. Much of O'Bie's time was spent in attempting to get many ill-fated projects off the ground. 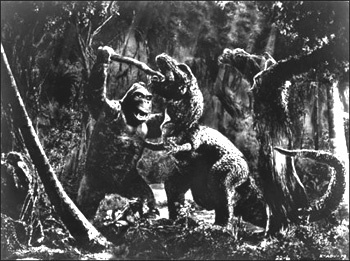 Amongst these was King Kong vs. Frankenstein, with plans for a stop-motion slugfest between the two famous monsters. Not well recieved in America, O'Bie brought the idea to Toho studios in Japan. It wasn't very well recieved there either, but after returning to America, a new film by Toho debuted: King Kong vs. Godzilla. Luckily, in many ways, this film was released after O'Bie's death in 1962. Another project was "Gwangi", about a group of cowboys who find a hidden valley of dinosaurs. This project wouldn't see fruition until 1969, when Ray Harryhausen produced it as Valley of the Gwangi. Attempting to relive the glories of dinosaurs and giant apes would be a running theme throughout the rest of his life. Towards the end of his life, O'Bie was often relegated to an effects supervisor... Often on films that had more use for his name than his work. One of these films, bringing his life full circle, was the 1960 version of The Lost World. Irwin Allen brought O'Bie on board, but for no real purpose other than recognition. Maple White Land of the 60's was a place populated by baby alligators in fins and trick photography. Some of O'Bie's other work includes 1935's The Last Days of Pompeii, 1936's The Dancing Pirate, 1956's The Animal World, and visual effects work on Citizen Kane. Willis O'Brien is a name that goes down, rightly, in the annals of cinema history as a true special-effects pioneer. O'Bie, as he liked to be called by his friends, made many films, but is most remebered for his work in The Ghost of Slumber Mountain and his successes The Lost World, King Kong, and Mighty Joe Young. Born in California in 1886, O'Bie held a variety of jobs and hobbies during his formative years. Two of these would stand out and foreshadow his later career: serving as a guide to palaeontologists in Creater Lake region and sculpting and illustrating. One day, while making models with his friend, an idea was born. Young O'bie recognized that he could animate the models on the same principle that cartoonists used to animate drawings: by building a model and then moving it's parts one frame of film at a time, he could give the models cinematic life. Though this process of stop-motion animation had been invented and used already - including work by the grandfather of trick photography, Georges Melies - O'Bie invented it for himself and would go on to essentially perfect the artform. O'Bie was so certain that this art form would take off, that he went about creating a test reel to sell the idea to producers. In determining a concept for this test reel, O'Bie hit back upon his other love: prehistoric creatures and palaeontology. This crude film he produced about a fight between a cave man and a dinosaur was fraught with problems - it was less and a minute and a half long, the movements were jerky, and the models began to melt under the light - but it worked. A producer was sold on the idea and gave O'Bie $5000 dollars to make another short film. Returning to the theme of dinosaurs and cave men, he created Dinosaur and the Missing Link (1915), the comedic story of Neandertal pre-nuptual dilemas. This film was later seen by Thomas Edison, who promtly bought the rights to it and hired O'bie to produce more shorts. Dinosaur and the Missing Link. Morpheus Mike, another 1915 offering, used relatively crude animation to tell the story of a hobo who dreams of himself as a caveman in a prehistoric restaurant. Missing Link and Morpheus Mike, like those "Mannikin Comedies" that came after, derived their humour from largely the same source as The Flintstones. O'Bie transplanted modern tribulations and aristocratic mannerisms onto cavemen for high anachronistic effect. The following year saw Prehistoric Poultry: The Dinornis or Great Roaring Whiffenpoof, about the ecology and habits of giant primodrial fowl, and the second best of the series, R.F.D., 10,000 B.C., in which a romantic youth has his love letter switched for a crude charicature by his rival, the postman. 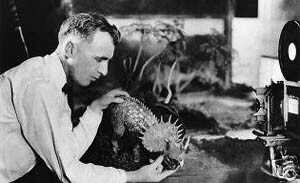 On the strength of these short films and other educational films he produced with Edison, a producer named Herbert Dawley hired O'Bie to animate a full length dinosaur film entitled The Ghost of Slumber Mountain in 1919. The story revolves around an uncle telling his nephew and friends about the time he was out in the woods and came across a cabin in the woods occupied by the ghost of a palaeontologist. Exhorting him to look through his spyglass, the narrator sees magnificent prehistoric scenes unfold before him. The Ghost of Slumber Mountain. In the hands of Dawley (who, among other things, even claimed that many of the dinosaur models were life sized), the leftover footage from Slumber Mountain made its way into Along the Moonbeam Trail in 1920 and the documentary Evolution in 1923. Prospects were looking down, but this film was the best thing to ever happen to O'Bie. By 1922, Dawley's attempts at noteriety had come and gone while O'Bie was working studiously on another, greater, motion picture. Hollywood knew who did The Ghost of Slumber Mountain, and producer Watterson R. Rothacker hired O'Bie to do the animation for the first film adaptation of Sir Arthur Conan Doyle's novel The Lost World, one of the great epic adventures of the silent screen. O'Bie working on a model for The Lost World. The Lost World was huge, but Hollywood is a fickle creature. O'Bie had his difficulties in following up the success of his first grand picture. His first project was a film about Atlantis, but after months of work on its fantasy monsters, it fell through. 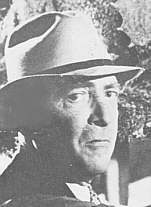 Then O'Bie and The Lost World's director, Harry O. Hoyt, proposed a sequel to The Lost World, but it was lost in management changes at First National Pictures. Another dream of O'Bie's was to film Frankenstein, using stop-motion for the long shots of the monster ripping trees up by the roots and other such things. But this dream wasn't to reach fruition. He also wanted to adapt H.G. Wells' tale of gigantism, Food of the Gods. O'Bie had plans for a dinosaur western as well, with cowboys roping allosaurs, but this project wouldn't be seen on the screen until it was made by his successor, Ray Harryhausen. The sole still photo mock-up from Creation. O'Bie's final silent project was Creation. On the cusp of the sound revolution, he was brought into RKO Pictures by Hoyt and developed a project with him and Marcel Delgado focusing on a volcanic island that had just appeared in the Pacific and of the submarine crew which ventured upon it, only to find a thriving dinosaur ecosystem. After a year of drawings, plans, scripts, and model-making, all the project had to show for it was a several-minute long test reel before the whole thing was dropped. 1931 was only a year or so after the great stock market crash, and making as expensive a film as what Creation was promising to be was suicide. Creation was the height of O'Bie's pre-sound craft. The models were more precise, and the interaction of stop-motion with live scenes was becoming better and more daring. The test reel shows two basic sequences: in the first, a young triceratops wanders off from his family to investigate the island when a sailor sees and shoots him. The other is the mother triceratops chasing the sailor with full steam. Like in The Lost World, O'Bie has the sensitivity to portray the dinosaur as a real creature, the triceratops as a real family going about their daily routines, instead of as monsters sitting around waiting for some heroine to menace. The chase scene is also very innovative, featuring several shots looking over the back of the mother triceratops down on the hapless human. All was not lost for O'Bie though. Creation would be revived only a few years later by RKO, but with a different premise, and would become one of the true classics of the talking screen. It would be the story of a giant ape and the woman he loved. It would be King Kong. Never again would Willis O'Brien reach the heights he reached with The Lost World and King Kong, even to his death in 1962. Promotional stills from King Kong.